When you click the Produce button, CyberLink PowerDirector enters the produce window. Here you can compile your movie into a file that is ready for a variety of uses, including e-mailing to friends, uploading to YouTube or for burning to disc at a later date. Note: if you want to burn your current movie production to a disc right away, go directly to the Create Disc module. In the Create Disc module you can create a disc menu, produce your movie, and then burn it to disc, all in a few simple steps. 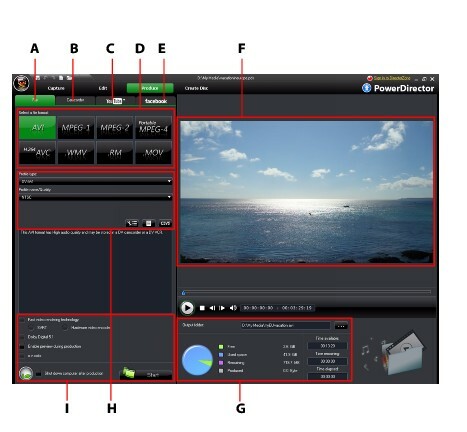 The production window is an easy to use interface that makes video production effortless. Note: before producing your movie, make sure that all of your video clips have the same interlacing format. This is an extremely important step to take before production, as it can drastically affect final video quality. If you produce your movie and find the video quality unsatisfactory, verify if the interlacing format of all of your video clips is the same. If your clips have different interlacing formats, set them all to the same format, then produce your movie again. For more information, see Setting Video Clip Interlacing Format. Click on the File tab if you want to output your video to file that you can watch on a computer, portable device, or burn to a disc at a later date. There are file formats available for all of your production requirements. See Outputting to a File for more information. Click on the Camcorder tab if you want to produce your video and then output it to a DV, HDV or HDD camcorder. See Outputting to a Camcorder for more information. Click on the YouTube tab if you want to upload your video to YouTube. When you select this option, CyberLink PowerDirector produces your video and then uploads it directly to your YouTube account. See Uploading Video to YouTube for more information. Click on the Facebook tab if you want to upload your video to Facebook. When you select this option, CyberLink PowerDirector produces your file and then uploads it directly to your Facebook page. See Uploading Video to Facebook for more information. Note: you can also produce multiple created movie projects at one time from within the Edit window using the Batch Produce feature. To perform a batch production, select > File > Batch Produce.